U-Kiss has fallen into a dilemma over the title song selection for its upcoming Korean comeback.The U-KISS members have confirmed they would be returning in mid-April, and are currently pouring their heart and soul into the new album, for which they have already collected over 100 tracks. Moreover, the group also had to speed up its hallyu activities abroad because of the importance of its looming comeback. However, the group still has not selected a suitable title track for its album and U-KISS and its agency NH Media are deeply concerned over the ongoing process. 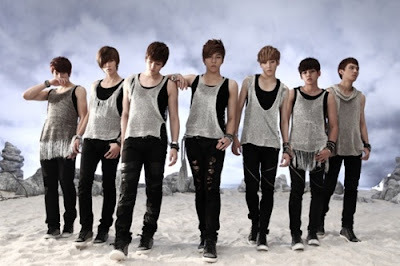 On March 30, a rep from NH Media met with enews and said, “Although U-KISS selected the date for its upcoming comeback, there are still concerns over the missing title song as of yet. We have asked for the assistance of famous composers and are pouring our heart and soul into the selection process.”The group is planning to choose its title song from the list of songs that they have received and are still sorting through.Furthermore, U-KISS and NH Media are carrying a heavy burden with its upcoming comeback because it will be an important opportunity for the group to solidify its status in Korea.“[U-KISS’] new album that will exceed the expectations of its patient fans, who have continuously showered them with their interest and love,” the rep added.U-KISS’ energetic activities will soon be broadcast to viewers nationwide through its upcoming comeback and the Super Action drama Holy Land, which still star U-KISS’ youngest member Dong Ho.